Spring to the Sky won the 2015 Laurel Dash. Photo by Laurie Asseo. 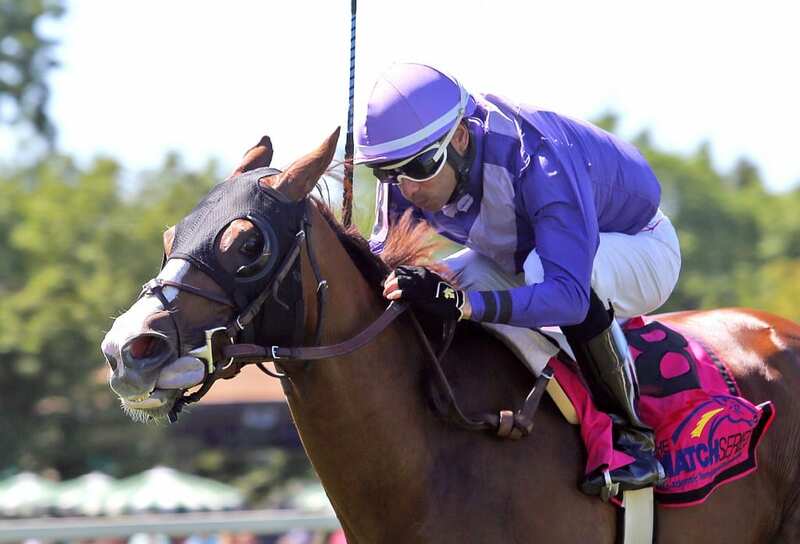 Our In Focus Guide offers the most in-depth analysis and commentary to the MATCH races at Laurel Park on September 22! 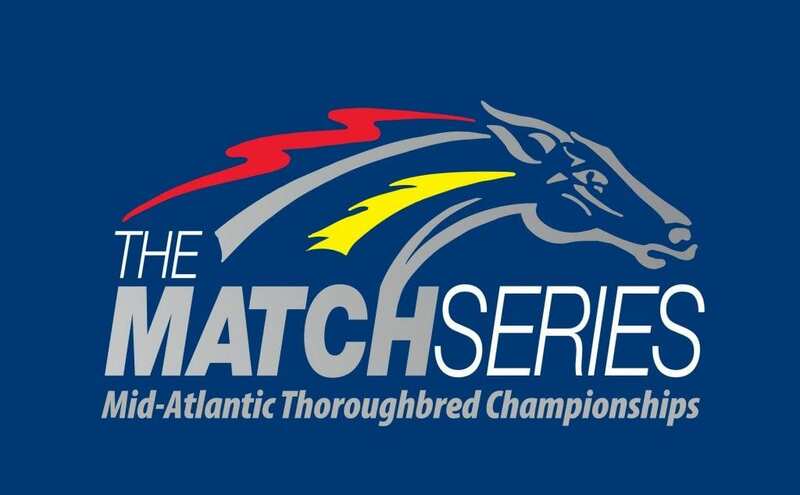 The MATCH Series three-and-up turf sprint division reaches its conclusion in this event, and while the division winner is already determined, this event could have a major impact on the overall championship. #6 Oak Bluffs (10-1) has won the division with 22 points; with a win here, he would get to 34 points, equal with the sprinting filly Jessica Krupnick, and he would get the nod on tie breakers. So trainer Mary Eppler has every reason to have him all the way cranked today. One concern: the veteran likes a firm turf course and, after rain on top of rain on top of rain in central Maryland, isn’t likely to get quite the firmness he would like. He’ll also have to contend here with the top two finishers from last year’s Laurel Dash in winner #2 Snowday (8-1) and runner-up #3 Class and Cash (9-2). The former ran a good one after that in the Belmont Turf Sprint, but his two subsequent stakes tries haven’t been much to look at, while the latter has been running exclusively in route races since. That at least means he should be dead fit for this one. The 2015 winner, who was fifth a year ago, also is here in the form of #4 Spring to the Sky (10-1). The Bruce Brown trainee is working on a 15-race losing streak, though, so he’ll need to find his way back to best form under Trevor McCarthy. Look for horses like #1 Fielder (10-1), Snowday, #5 Axtell (15-1), #7 Tombelaine (9-2), #8 Celebration (30-1), and #11 Clever Triad (6-1) to be on or near the lead early in this one, which could unleash the closers on that long Laurel stretch. This race runs directly through the horse who will win the MATCH Series filly-and-mare turf sprint division: #10 Smiling Causeway (9-5). With only two starts to date, she would not have run had this race been a week ago when originally scheduled. But when it was postponed, trainer Arnaud Delacour entered her after all. 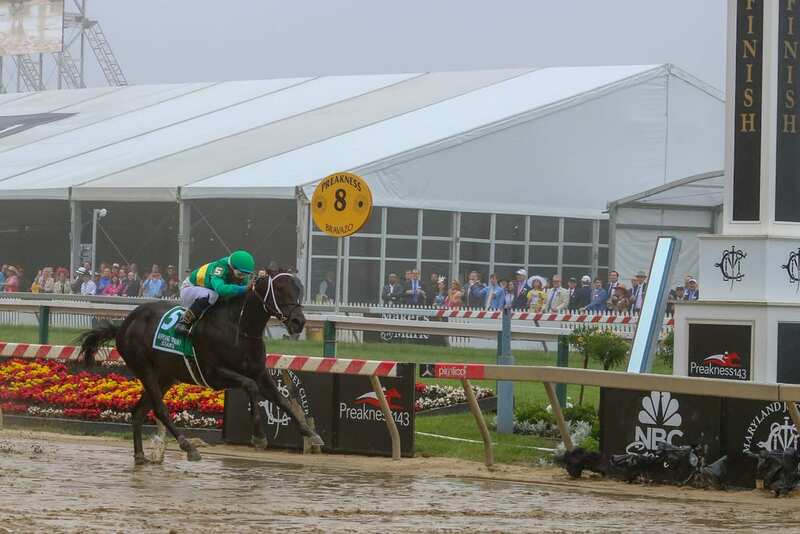 She previously had run up-the-track in the off-the-turf The Very One on Preakness day at Pimlico before posting a dominant score in the Turf Amazon at Parx Racing. Last out, she was a so-so sixth, but that was against the boys in the G3 Turf Monster. If there’s a chink in her armor, it’s that she’s failed late in both of her six-furlong efforts. But the Arnaud Delacour trainee has been in overall very good form and certainly figures tough in here. The runner-up in the division will be #8 Daylight Ahead (30-1). It’s been a tough year for this Hugh McMahon trainee, whose only prior try at the six furlong trip netted a win in the Jameela in June 2107. But though her two prior tries in MATCH Series races weren’t pretty — sixth in The Very One, eighth in the Penn Ladies Dash — this third Series start will get her into bonus money territory. She will finish second in the division, regardless of her performance today. Speaking of the Jameela, this year’s winner is also here. That’s #11 Rocky Policy (6-1). That was her most recent start, and she was third in this event a year ago. Four races back in her only MATCH Series start, she closed fast to be second — at 20-1 — in the Penn Ladies Dash. Daniel Centeno will ride the Dale Capuano trainee. The top three finishers from last year’s Sensible Lady are all here, including show horse Rocky Policy. Winner #6 Always Thinking (8-1) hasn’t finished better than fourth since while keeping some really tough company. Her last was an off-the-turf version of a minor stake at MTH, so not especially relevant, but prior efforts were OK, though the results weren’t great (often with excuses). As for last year’s Sensible Lady runner-up, #4 Fire Key (15-1), who knows what to make of this one? Two races after the Sensible Lady, she won the Autumn Days at AQU with a 97 Beyer, and she began 2018 with a runner-up effort and a 90 Beyer. Her last three — one on soft turf, one on dirt, and one with a trouble line — have been all kinds of disastrous. If she can find her way back to the way she ran late last season or in June of this year, she could outrun her odds. 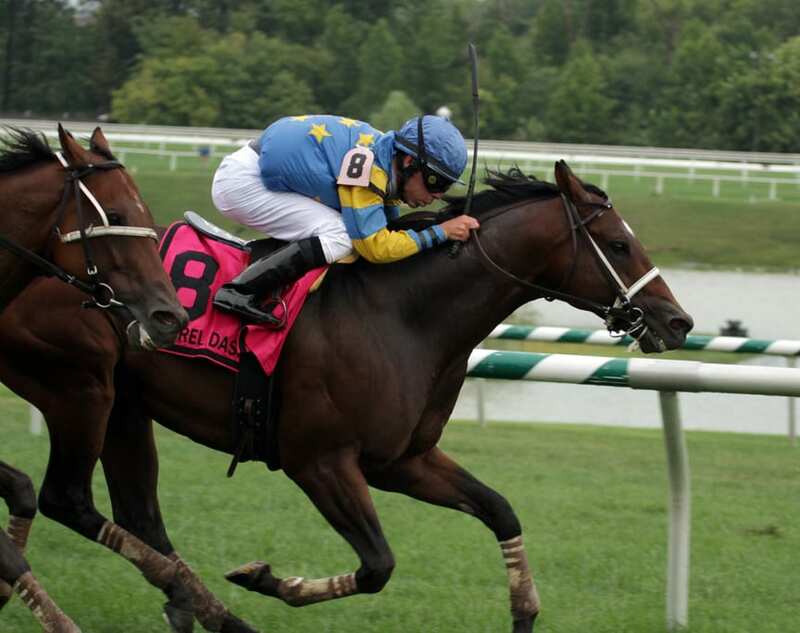 Switzerland won the Maryland Sprint Stakes, part of the MATCH Series. Photo by Dottie Miller. The latest edition of the Grade 3 Frank J. De Francis Memorial Dash has added intrigue: it can have a huge impact on the MATCH Series. #4 Laki (10-1) and #8 Lewisfield (5-1) have faced off three previous times, and last time out, in the Polynesian, they finished noses apart, Lewisfield first past the post but Laki ultimately placed first after being bumped by his rival. They will finish one-two in the three-and-up dirt sprint division. What’s more, a win here would give Laki the division title and the overall championship, while a win for Lewisfield would give him the division title and place him in a dead heat for overall honors. But neither gets the nod as favorite, that instead going to the very talented #1 Switzerland (5-2). The Steve Asmussen trainee dominated the G3 Maryland Sprint on the Preakness undercard back in May, which gave him four straight wins. He’s made just a single start since, however, that a fifth-place finish in the G1 Vanderbilt at Saratoga in July. He seems to be training well enough towards this test, but it’s perhaps notable that regular pilot Ricardo Santana, Jr. opted to stay at Churchill Downs today rather than joining this runner. Switzerland, the 2017 Maryland Sprint winner, is joined here by the 2016 winner. That’s #5 Always Sunshine (3-1), a runner who was in terrific form at that time but then went through some doldrums, losing nine of 10 at one point. The Ned Allard trainee has won two straight, however, last out taking the restricted Tale of the Cat with his first 100+ Beyer in over two years. Jevian Toledo is up. As the man said, pace makes the race, and this contest figures to have plenty of it. Switzerland, Always Sunshine, #8 The Man (8-1), and Lewisfield are all horses that have done their best work on or near the lead. If those horses start knocking heads up front, they could set it up for late runners to make a major impact — like Sweetontheladies, Colonel Sharp, and Laki.